Minnesota's State Capitol is one of the Midwest's most spectacular buildings. Inspired by the Beaux-Arts architecture of the 1893 World's Columbian Exposition in Chicago, architect Cass Gilbert was determined to design a building in the classical style, but with all the modern conveniences of the time. The stunning result is a towering white marble dome, fluted columns, graceful arches and commanding statuary. The current state Capitol building has been the center of Minnesota’s government since 1905. To construct a building of this scale was an ambitious undertaking for Minnesota, which had only become a state in 1858. Construction of the current Capitol began on May 6, 1896 and was led by architect Cass Gilbert, who would go on to design the U.S. Supreme Court building in Washington D.C. After nine years and a cost of $4.5 million, the Renaissance Revival-style building opened to the public on Jan. 2, 1905. The exterior of the State Capitol is made of white Georgia marble and St. Cloud granite. Six marble statues above the main entrance greet visitors. Daniel Chester French collaborated with Edward Potter to create the golden sculpture group at the base of the dome titled “The Progress of the State,” commonly referred to as the Quadriga. The copper sculpture, like the ball on top of the dome, is covered with gold leaf. Below the Quadriga are six colossal figures representing "the Virtues" sculpted in white marble from designs by French (actually, the statues in place today are replicas carved in 1975-79 to replace the deteriorating originals). Twelve stone eagles stand guard around the dome, and the exterior is enlivened by classical wreaths, plaques, and a rich variety of carvings. The outer layer is made of marble. Hidden inside is a supporting structure of brick and steel. Below that is the dome you see from the inside, looking up from the rotunda. The gleaming gold sculpture is the Quadriga, the Latin word for a four-horse chariot. It was designed by Daniel Chester French and Edward C. Potter, and it is made of sheets of gilded copper hammered around a steel frame. Six heroic-sized "Virtues" — classical figures representing Courage, Bounty, Integrity, Prudence, Truth, and Wisdom — are below the Quadriga, sculpted in marble from designs by Daniel Chester French. Cass Gilbert insisted on using Georgia white marble, saying that the use of a darker color would make it look "glooming and forbidding." Gilbert won out over those who objected that Minnesotans would lose stone-cutting and carving jobs if stone from out-of-state was used. As a compromise, the general contractor, Butler-Ryan Co., leased the Georgia quarry and shipped the rough-cut marble to St. Paul to allow local craftsmen to do the work on-site. 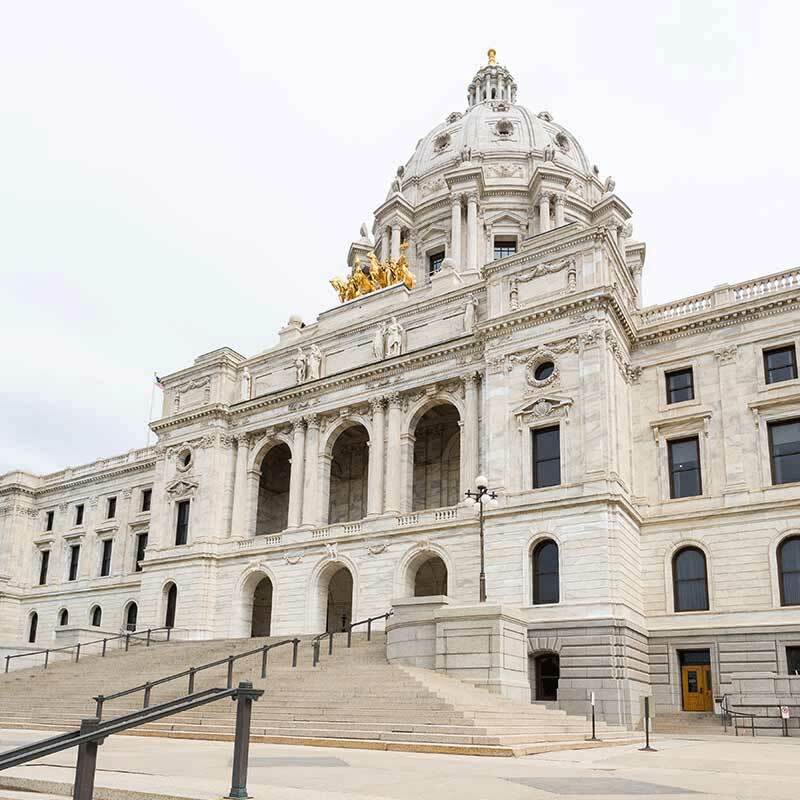 He also specified Minnesota-quarried granite for the ground floor level, steps, and terraces, and sandstone and limestone for the foundation and interior walls to fully represent the various stones from the state. The Capitol is more than 430 feet long, from east to west. From ground level to the top of the dome's lantern measures 220 feet — about the height of a 20-story building. Inside, the building has more than 300,000 square feet of floor space, or about 5 million cubic feet of space. The stunning building quickly drew acclaim from around the country. Architects and artists praised its exterior, its huge marble dome, its self-supporting stairways and its magnificently decorated interior. When the new Capitol opened, all three branches of state government, state agencies and commissions, and the Minnesota Historical Society were located in the building. But as government needs expanded, the building evolved as well. Although the main public spaces were left mostly intact, remodeling and enlargement of offices and meeting rooms, renovation of chambers and partitioning corridors began occurring as early as the 1930s.